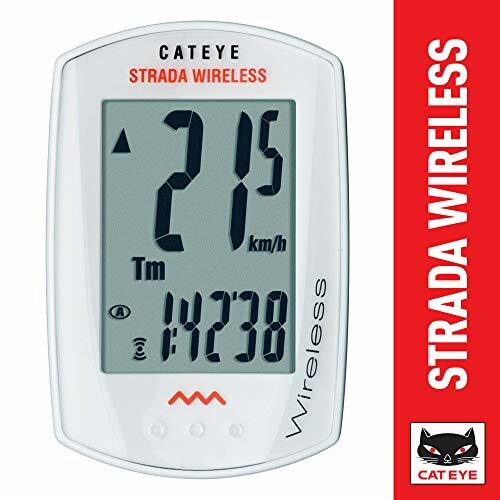 The CatEye Strada Wireless Bicycle Computer is a powerful computer designed with numerous bike functions and offers a wireless technology that communicates with the wheel sensor of the bike without running cables. It has a premium feel of elegance, very sleek, not too bulky and functions perfectly in providing information you need ahead. It ouputs functions like speed, both current, avearage and maximum speed for up to sixty five miles per hour, a dual trip and total distance calculator, timing function, and sports a portable clock. This information can be easily accessed to evaluate your workout and set future milestones. The computer is also very easy to program as its touchscreen interface is designed with clickTec to ensure speedy navigation. The on screen menu is clearly displayed and easy to navigate around menus using just a soft tap on the screen to display selected parameters. Attachment to the bike is achieved by a universal bracket that is flex-tight and can be mounted securely and quickly to handlebar or wherever on the bike is adequate for you. These installations are done tool-free. Attaches easily to a twenty two millimeters or thirty two millimeters frame or handlebars. Comes with two CR2032 batteries for both the sensor and head unit, using one each on both systems. Attaches seamlessly to a fork size between eleven millimeters to fifty five millimeters. Communicates wirelessly with the speed senor attached to the Front fork. Offers powerful transmission to distance of about twenty seven inches. 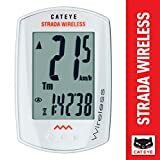 The CatEye Strada Wireless Bicycle Computer is very accurate and designed with style. It operates with the sensors wirelessly thus eliminating the need for plenty wires. It uses the clickTec method of functioning which offers a very seamless connection. Installation is fairly straightforward and easy and once attached to the frame or handlebar stays firm and does not come off even when you encounter small bumps. Programming the computer for the first time is easy if you follow the instructions that come with it. You can rely on the data it outputs as it is very accurate. The screen display is crisp and clear and you can navigate the functions by scrolling and it is responsive to one touch. To toggle the display, you can tap firmly on any part of the device. The computer can also withstand water splashes without any malfunction.